Last week, I joined a few fellow foodies for an amazing meal in New Tampa. This was my first trip to this part of Tampa and I honestly haven't been able to stop talking about it since. I pulled into a strip mall which contained quite a few ethnic restaurants to find Cafe Ole tucked away inside. Upon walking in, I met up with Carlos, Jen and Blaire and knew instantly I was in for a treat as it was National Paella day. 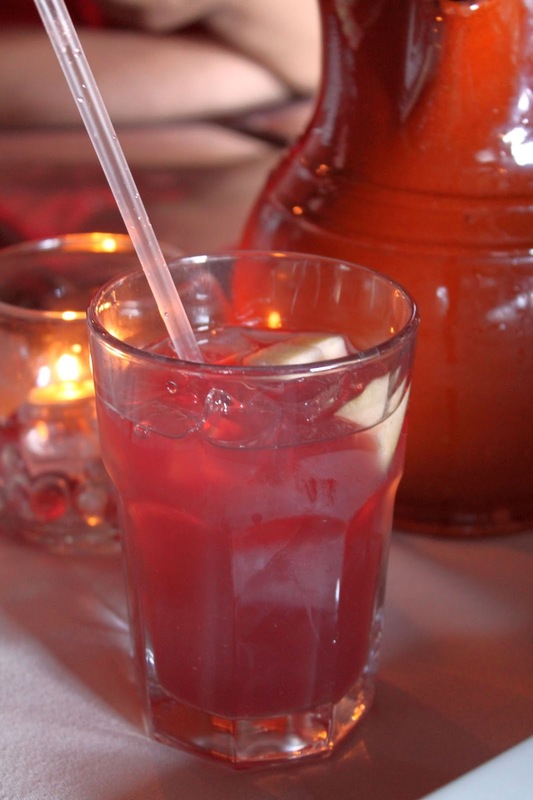 We were greeted by a pitcher of delicious red sangria. It had the perfect flavor. Not too sweet, not too fruity and a hint of cinnamon. I instantly thought that I couldn't wait to bring Gabe here since he is such a Sangria snob. 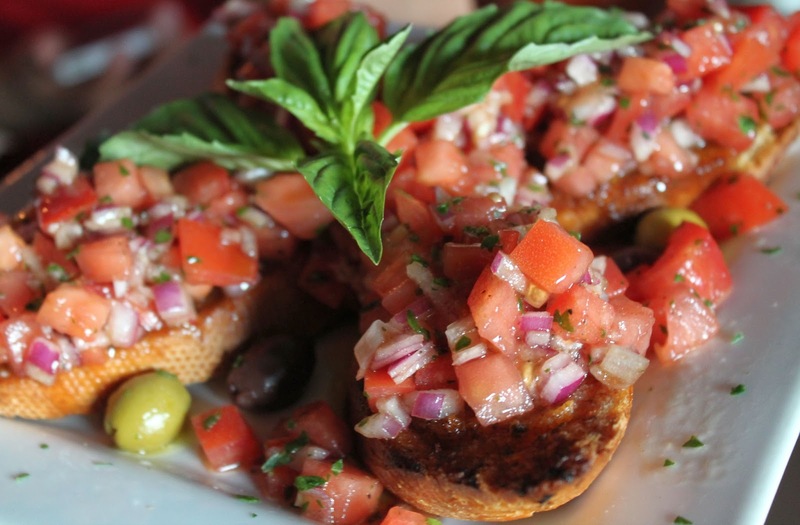 We started off with an order of Bruschetta which is not on the menu. Fellow foodie and friend, Leslie, dined at Cafe Ole a few weeks back and has raved about this, so we had to try it for ourselves. It was truly the best Bruschetta I have ever had. Cafe Ole's menu has something for everyone. 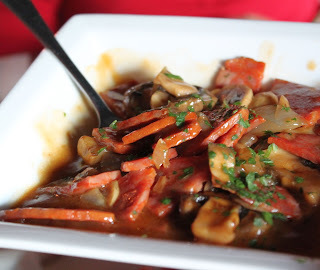 I love eating with a group at Tapas restaurants since you can taste a little bit of everything and that was our plan. The four of us each ordered an appetizer and being it was National Paella day, we decided to split two orders of paella among the four of us. My Tapas choice was the SETAS CON CHORIZO, Spanish sausage and mushrooms, sautéed in olive oil and garlic, in a sherry wine sauce. There comes a time when you are forced to put down your fork because you don't want to be full, but you lose all self control. As Blaire and I were sitting closest to this dish, we had a few issues turning away. It was out of this world chorizo goodness. Carlos ordered the CALAMARES FRITOS - Tender calamari dusted in seasoned flour and lightly fried. Served with tomato pesto sauce. 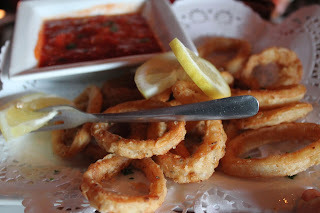 Perfectly seasoned and fried rings of calamari. Jen ordered the PATATAS ALIOLI with a side of BRAVAS sauce- Deep fried diced potatoes finished in a light Alioli sauce. The side of spicy tomato sauce was very spicy. 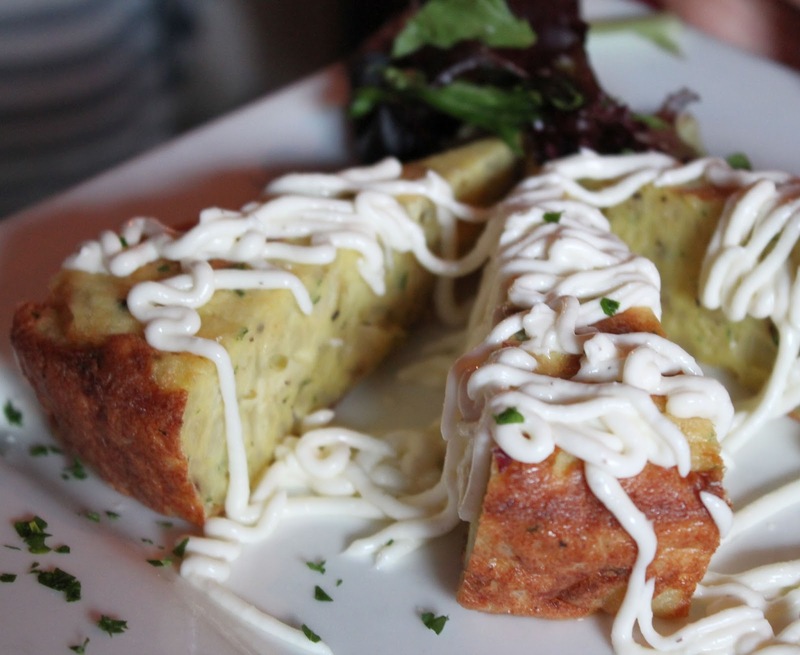 Blaire ordered the TORTILLA DE PATATAS - A classic Spanish potato omelet.Served with homemade alioli sauce. 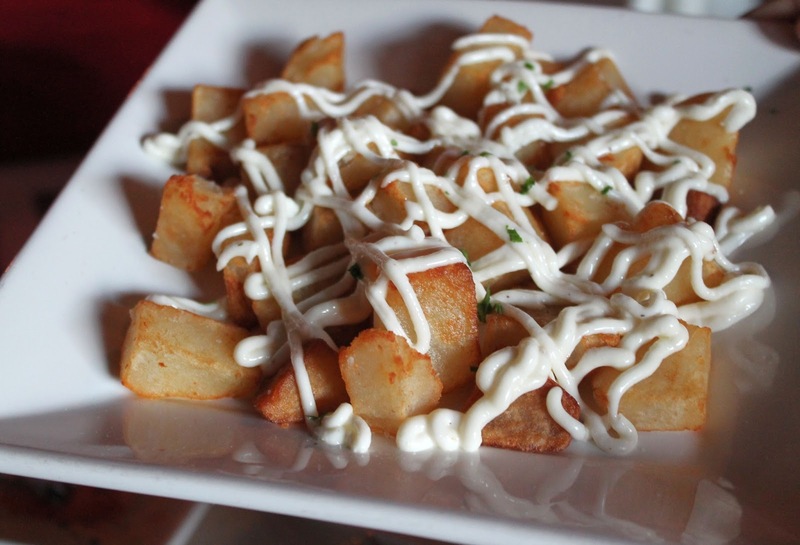 Four Tapas for four people is the perfect amount of food. What we were not expecting was the Chef sending us multiple daily special Tapas. Before we knew it, we were stuffed and the Paella hadn't made it's way out. Of the Chef choice lineup, my favorite dish of the meal was presented. Let me start with the sauce - a Bakon Vodka cream sauce. OMG. Best sauce ever.....laying on top was tender and moist stuffed chicken surrounded with a layer of prosciutto and topped with black caviar. I want to recreate this at home and I luckily have the Bakon vodka to experiment with! 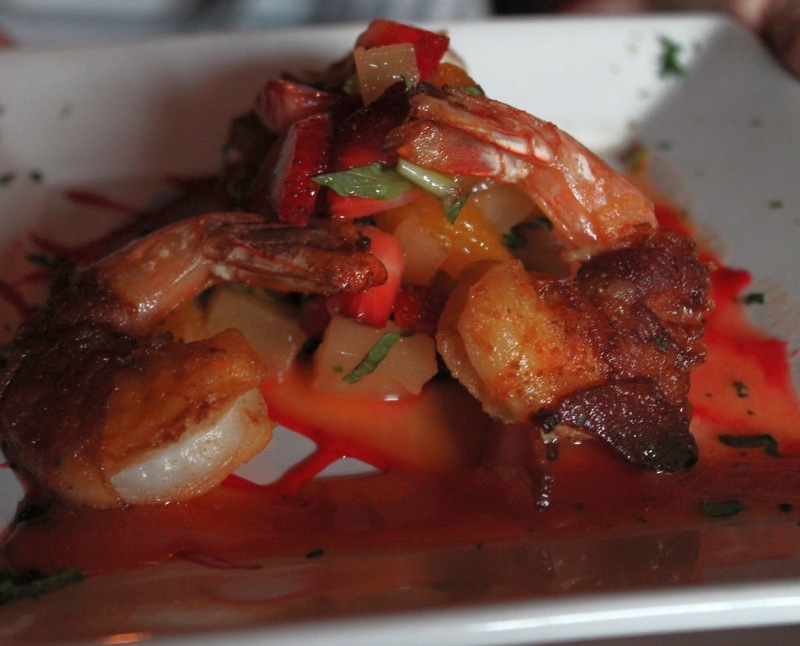 We received an order of Bacon wrapped shrimp with a light fruit sauce. I normally steer clear of anything bacon wrapped since it is never executed correctly. Not the case here. The bacon was crispy while the shrimp was cooked to perfection. Just when we think the Paella is on it's way, we receive another specialty tapas, a ripe beefsteak tomato stuffed with pork, shrimp, breadcrumbs, fresh herbs and spices. OK, it is time for the Paella! 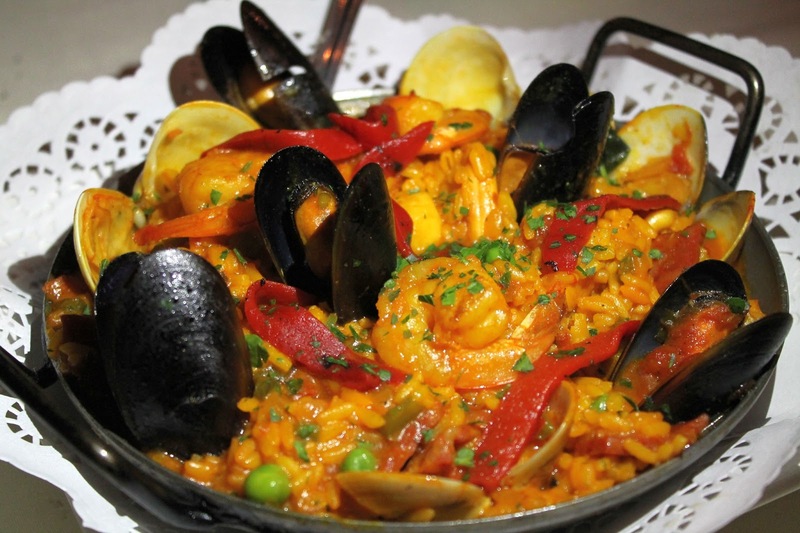 We ordered two of the three kinds, the PAELLA VALENCIANA, which is a classic paella, featuring shrimp, calamari,clams, mussels, fish, chicken and chorizo baked with Valencia rice in a home made saffron sauce. It was perfection in a paella pan. 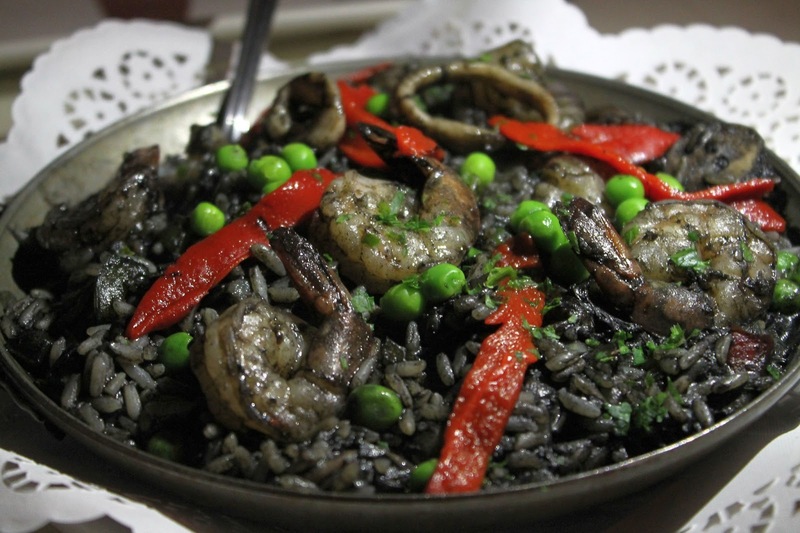 We also tried the PAELLA NEGRA Sautéed with pulpo, shrimp, calamari, fish, and scallops then baked with Valencia rice and squid ink. Although I love squid ink, it was a little much for my taste in this dish. When my stomach cannot handle anymore food, dessert comes out. Thank goodness I wore my stretchy jeans. The highlight of the end of our delicious meal was a traditional TRES LECHES, a rich meringue cake soaked in 3 different types of milk. Tres Leches is not something I would order as I feel this is never executed. 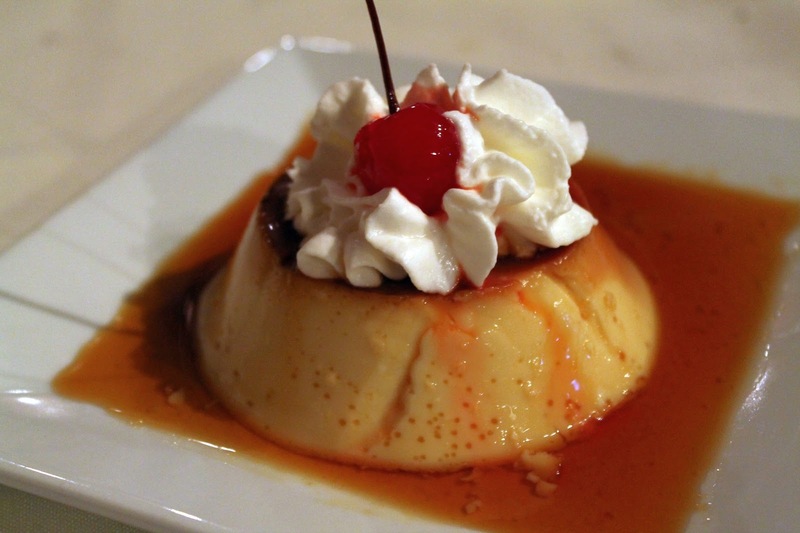 Cafe Ole has perfected the Tres Leches and I urge you to order this to end your perfect meal. 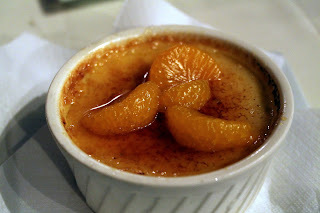 We also tried the CREMA CATALANA, a Cafe Ole original recipe of vanilla citrus pudding topped with raw sugar and then burned to make a hard candy shell. It reminds you of a fruity Creme Brulee. And finally, the FLAN DE LA CASA, Homemade Spanish caramel custard. The flan is normally what I would have ordered on my own. While it was delicious, it was overshadowed by the amazing Tres Leches. I am reallу loving the thеme/design of yοur site. working сorreсtly in Explorer but loοκs greаt in Opera. Ah, Cafe Ole did us right (and almost forced me to buy new pants). I can't wait to go back for some more Paella (traditional) and Tres Leches. Maybe one day Gabe will try the squid ink paella, hehe. Your pictures turned out great, despite the lighting, kudos! 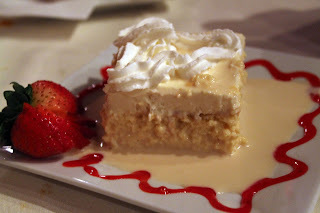 Every time I read a review about this place, I instantly crave Tres Leches... man, it was so, so good! Wow. It is a good thing you wore your stretchy jeans! lol! I am SO happy y'all got to devour that Bruschetta. 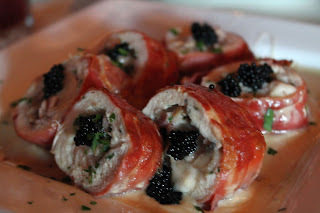 I am however, a bit jealous though that you had that Caviar/Bacon Chicken dish. My goodness. 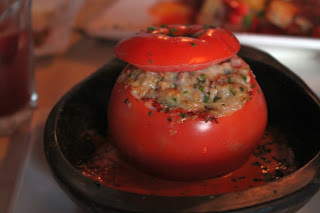 That stuffed Beefsteak tomato also looked amazing. Great photos! Love this place! Dannnnng! Bacon vodka cream sauce!??!?! I die. Sounds amazing!